After breakfast, we said goodbye to the Harte and Garter Hotel and travelled on to Hatfield House in Hertfordshire. 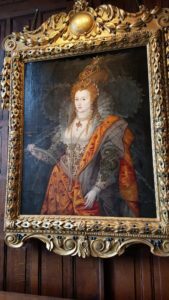 Although the main palace is Jacobean, having been built in 1611, in the reign of James I, it houses many treasures from the time when there was a 15th century palace on the site, the home that Elizabeth knew in her childhood and youth. The only part of that former palace that still survives today is the part of the houses that houses the Banqueting Hall with its wonderful original timber roof. Wonderful pics. I see what youean about the size of the bed. Love the pic of the oak. Though I know it’s not the original I still kind of get chills seeing the spot where such history was made. Again, thank you for sharing. Glad to see Francis found a friend! My god that bed is huge it must be an extra king size, bet you felt like a princess in it Claire, Hatfield House is quite local to me and over the years iv visited with the school and our long suffering history teacher, it’s had fairs and iv also visited as a birthday treat and went for a ride in a pony and trap, it was lovely, Hatfield is enchanting and I especially like the old palace as that is Tudor and was where the young Princess Elizabeth stayed, it has important artefacts and documents and the surrounding countryside is eerily old fashioned, very hilly and with no modern buildings in sight to mar the landscape,one of my schoolmates described it as spooky and to the young eye it did seem so to many of us, my nephew when young especially liked visiting and it’s perfect for a picnic, I’m glad your enjoying yourself Claire and it’s a treat seeing all the lovely photos it brings back happy memories for me. Meant to say I love the ‘Rainbow’ portrait of Elizabeth it is my favourite one of her, it’s obviously meant to flatter as her features are somewhat softened unlike in other portraits, her curling auburn tendrils spill over her shoulders and her expression is sweet not haughty looking as she often appears in her other pictures but still every bit as regal.